Malaysia’s business environment is considered to be far more favourable than that of its regional neighbours, apart from Singapore, and the financial sector is strong. The Malaysian population is an ethnic and religious mix of Muslim Malay (50%), Buddhist Chinese (24%), Hindu Indians (7%) and indigenous people (11%). Despite its majority, the Malay population possesses only about 19% of the wealth. Racial tensions have always simmered under the surface, but have not surfaced in over 40 years, thanks mainly to a massive affirmative action policy favouring ethnic Malays. However, this policy has hindered Chinese and Indian minorities in their social and economic progress. The continuation of this so-called pro-bumiputra policy or the possible cutback of it, is one of the major political issues. The Barisan National (BN) coalition led by the United Malays National Organisation (UMNO) has been in power since independence in 1957. Despite growing electoral successes by opposition parties, UMNO remains firmly in power. The biggest risk to political stability would be a severe wrangling within UMNO, since the party is divided between conservatives (in favour of continued pro-affirmative action policy) and reformers (in favour of political and economic reforms). While Prime Minister Najib Razak belongs to the reform camp, he also has to accommodate conservative UMNO members. The traditionally strained relations with neighbouring Singapore have improved significantly over the last few years, with increased cooperation between the two countries in joint business development and tourism. Gradual economic integration is expected to continue. 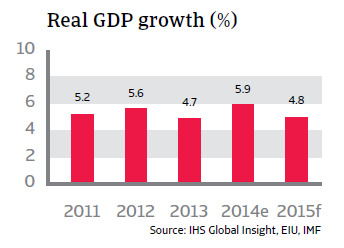 After strong growth of 5.9% in 2014, the increase in GDP is expected to be slightly lower in 2015 (4.8%). While the lower oil price should detract from export performance, growth is expected to be driven by private consumption (strong labour market) and investment in infrastructure (e.g. the high speed train to Singapore). Malaysia’s business environment is considered to be far more favourable than that of its regional neighbours, apart from Singapore, and the financial sector is strong: notably with successful Islamic banking. 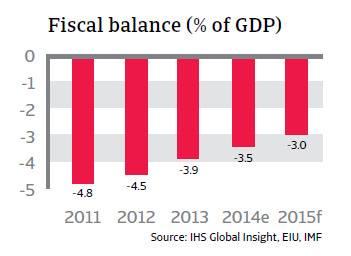 Weak fiscal discipline and huge expenditures on fuel subsidies have led to structurally large budget deficits. Indeed, the country has not had a surplus since 1997. As any improvement to Malaysia’s credit rating and to more longterm investment is constrained by this weak fiscal position, the government is determined to reduce the budget deficit by widening the tax base and cutting subsidies. Subsidies for gasoline and diesel have already been cut, and a goods and services tax of 6% takes effect in April next year. The budget deficit is expected to decrease to 3.0% in 2015 as a result of the tax increase. 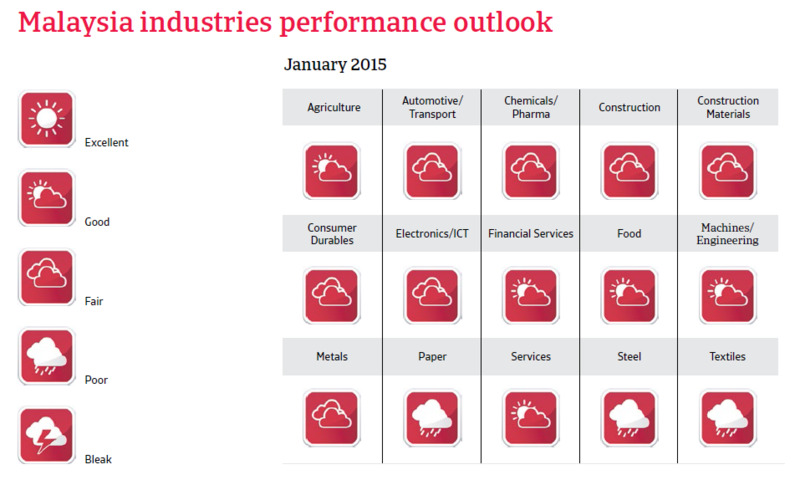 Inflation is expected to rise to 4.0% in 2015. 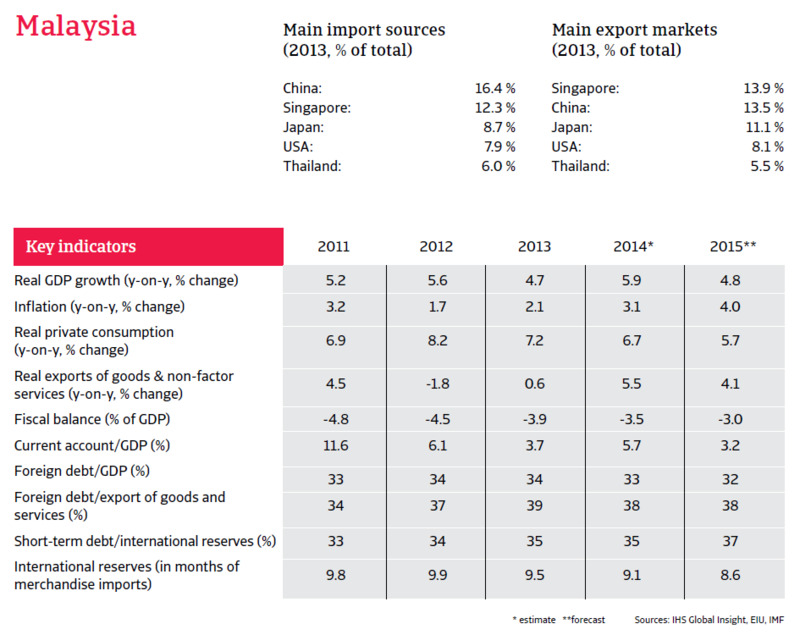 Malaysia’s sovereign payment capacity is guaranteed by low foreign debt (32% of GDP; 38% of exports of goods and services in 2015), ample liquidity and a relatively well diversified economy. International reserves amount to more than eight months of import cover. Thailand ́s open and export-oriented economy is expected to benefit from a modest global recovery this year.